Justice Says FISA Was Used To Help Crack 2010 Oregon Bomb Plot : The Two-Way Prosecutors acknowledge they built their case against Somali-born U.S. citizen Mohamed Osman Mohamud partly with secret surveillance information — an admission that could delay his sentencing. The case against a Somali-born U.S. citizen convicted in a foiled bombing plot was built partly on secret information "obtained or derived" from the Foreign Intelligence Surveillance Act, the Justice Department has acknowledged. A jury convicted Mohamed Osman Mohamud in January of attempting to use a weapon of mass destruction at a Christmas tree lighting ceremony in Portland three years ago. 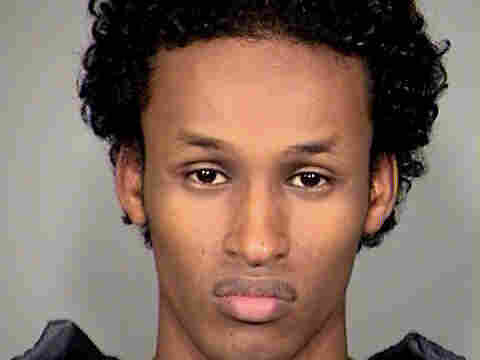 Mohamud, a naturalized U.S. citizen, faces a possible life sentence. He had been scheduled to be sentenced by U.S. District Judge Garr M. King on Dec. 18, but that proceeding could be delayed as lawyers wrangle over the use of overseas surveillance materials. Oregon U.S. Attorney S. Amanda Marshall filed a two-paragraph notice Tuesday evening acknowledging to the defense that FISA had been used. It's part of a broader stream of disclosures to defendants that the U.S. government used warrantless electronic foreign intelligence surveillance in some way in the proceedings against them. For their part, prosecutors were tight-lipped about the new disclosures, referring calls to the Justice Department headquarters in Washington. "In keeping with the department's ongoing, publicly confirmed review, the government has given notice that evidence derived from Title VII of FISA was used in this case," Justice Department spokesman Andrew Ames said. It's not clear exactly how prosecutors used intelligence intercepts in the Mohamud case. But earlier this year, The Oregonian reported that testimony during his trial revealed that the 22-year-old wrote for an electronic magazine devoted to jihad, exchanged emails with accused terrorists, and kept in touch with another man who traveled outside the U.S. to join the fight against "coalition troops in Afghanistan." Defense lawyers Stephen R. Sady and Lisa Hay of the Federal Public Defender's office had argued that Mohamud was entrapped by undercover FBI agents who brought him a phony fertilizer bomb to use in an attack. Sady and Hay did not return calls for comment about whether they planned to try to suppress the use of the secret surveillance intercepts, or challenge the notice that came nearly 10 months after Mohamud's criminal conviction. Federal Bureau of Prisons records indicate Mohamud is now living in a medium-security facility in northwestern Oregon. It's not known if the Justice Department will file similar disclosures in already closed cases, in which defendants are incarcerated, but one of these cases could eventually find its way to the U.S. Supreme Court. To challenge the constitutionality of the surveillance law, people need to demonstrate they have been harmed, and new proof that the government has used a section of FISA known as 702 in a criminal prosecution would finally give a defendant the "standing" to bring a case. For previous coverage, see: Government Takes A U-Turn On Warrantless Wiretaps and U.S. Will Disclose Use Of Secret Wiretaps To A Defendant.